Each of the refined pieces in our Soho Bag collection boasts a slimline silhouette with a chic detachable metal snake chain and a versatile leather wristlet. 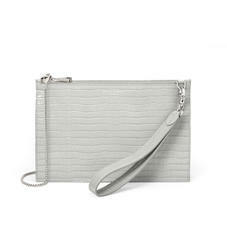 Lined with our signature shimmering grosgrain, the interior of each piece is spacious enough to store your essentials, yet the bag itself has all the exquisite delicacy of an evening clutch with its patent, classic croc finish. Just like many of our handbags, the Soho will make a most elegant companion for evening engagements this spring & summer.